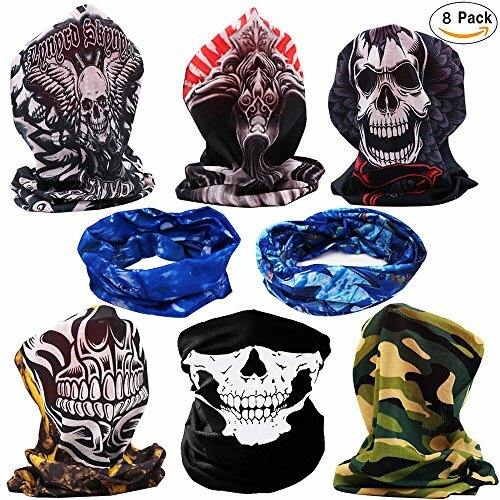 DOLAIMI half mask has a variety of usage, it can be used as a neck set, scarf, headband, no brimmed hat, pirate hat and so on, Suitable for all kinds of conditions, including skiing, mountain climbing, motorcycle, Biking, jogging, hiking, etc. When the weather is too cold, fold it together and it will play a more warm effect. Size: Free size, fit for both adults and kids. Lightweight, Breathable, Absorption moisture, Sweat wicking, Single-sided. Material: 100% Breathable Microfiber Polyester, no irritating seams or hems. 8 differert style, meet your differedt need. Perfect for group activities. Delicate adhesive agent printing, multiple usage, Great costumes for Halloween，Perfect for motorcycle, tennis, skiing, motorcycle snowboarding, hiking and anything outdoors. If you have any questions about this product by DILIMI, contact us by completing and submitting the form below. If you are looking for a specif part number, please include it with your message.